Davis Love III, left, and his son Dru Love walk down the second fairway after teeing off during the first round of the Father/Son Challenge in Orlando on Dec. 13, 2014. 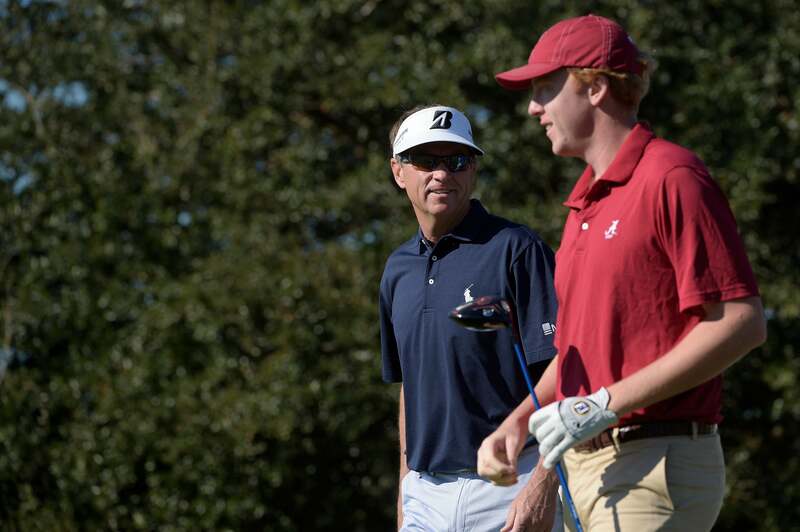 ST. SIMONS ISLAND, Ga. (AP) The son of Davis Love III will make his PGA Tour debut next week at the tournament where his father is the host. Dru Love III - his given name is Davis Love IV - has received a sponsor exemption to the RSM Classic at Sea Island, the final PGA Tour event of the year. Love plays for Alabama and won the Puerto Rico Classic this year. He also won the Georgia State Amateur Championship on the Seaside Course at Sea Island, the main course for the RSM Classic. The RSM Classic is being held on two courses at Sea Island this year because the tournament wanted to be sure everyone with full tour status got in. At the commitment deadline Friday, Mark Hensby was first alternate.